Shortly after I began brewing I ran across Brulosopher's yeast harvesting article and started my own liquid yeast bank. Initially, it was recommended that once the yeast settled you should decant the beer and replace it with sterile water. This was my practice until many of those re-using yeast started to leave the beer over the yeast cake, reasoning that the alcohol would provide some measure of protection from bacterial contamination. That sounded reasonable to me and I began to leave the beer over the yeast cake to store it. It has probably been over a year that I have been storing yeast that way and I have had this nagging feeling that it takes my starters longer to get going since I changed. I've started thinking about alcohol being toxic to cells and wondering if this is really the best practice, so, I decided to perform a little pseudo-science to see for myself if one was better than the other. Is there a noticeable difference in starters where yeast was stored under sterile water versus yeast stored under beer? The Yeast: WLP001 harvested from a starter 9/30/15 and WLP002 harvested 10/3/15 were used. They both were stored in the vials two months before these starters were done. One vial was stored under the beer and the other had the beer decanted off and replaced with boiled/chilled water. There were roughly 50 billion cells of the 001 per vial and roughly 70 billion cells of the 002 per vial. All vials have been stored in my refrigerator. The Starter: A one liter starter was made with 101 gm of Light Dry Malt Extract with one eighth of a teaspoon of Wyeast Yeast Nutrient. The starter was made, brought to a boil, and chilled. The yeast and starter were place in labelled 2 liter flasks within two minutes and placed on stir plates. 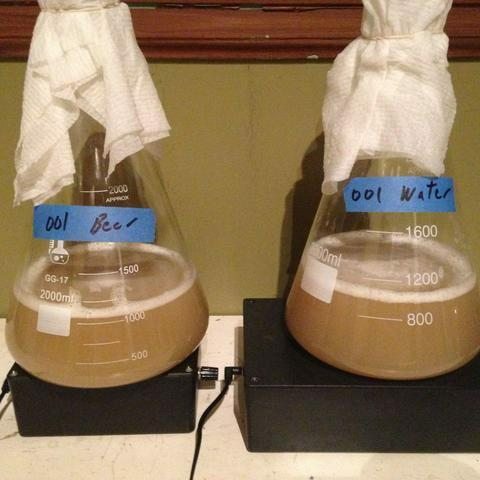 With the stir plates side by side, visual differences in cell density were looked for and recorded by camera at intervals during the fermentation. Flasks - The flasks are not identical and different shapes could affect the perception of cell density. Stirplates - Using two different sized Stirstarter plates. One is meant for 2 liter flasks and one is big enough for 5 liter flasks. The difference between the two samples was not great. The WLP001 seemed to have a greater density of yeast in the flask of the yeast stored under water. The WLP002 seemed to have a greater density of yeast in the flask of the yeast stored under beer. That may not show up well in the above photos. The flasks and stir plates were switched for the WLP002. The results were somewhat confusing and not what I expected. After the WLP001 was done I was expecting the same results with the WLP002, confirming my bias. Instead, I'm faced with inconclusive results. While it is not what I expected, it is helpful in that it does not appear that there is a big difference in viability between the two mediums for storage. I will likely continue to replace the beer with water since it's 'prettier' and because I wash the yeast with Chlorine Dioxide to minimize bacterial contamination. This article looks weird on mobile. All the pictures are separated from the captions with a lot of blank space. Not sure. I made it to look how I wanted on BU and did not look on mobile.